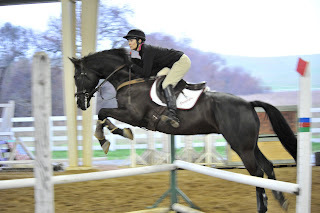 In what I hope to be a reoccurring occasion, I had the good fortune of taking a jumping clinic this past January. 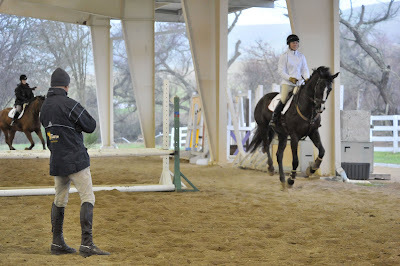 The Baxters of Twin Rivers Ranch coordinated a clinic with Olympic Gold Medalist, Lesie Law to be held over two days. Unfortunately, these two days happened to fall on the week of some of the worst weather California has ever seen! When we arrived at Twin, poor Andrea was scrambling around trying to decide if she was going to have appropriate footing at her facility to hold the clinic or if it was going to have to be moved. 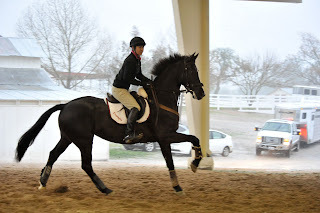 In the end, the clinic was moved to the indoor arena at Rainbow Ranch, where only when the wind was blowing completely sideways, did we get wet! Since Billy and I have been resting on our laurels after our win at Galway last Fall, I was a little nervous that we would be in deep water since I had only jumped a handful of times in so many months. Not only that, Billy tends to be quite spooky and distracted, so I wasn't sure how he was going to react to the ultra stimulating weather. Luckily for me, it was so overwhelming to him that he was quick to listen and respond.... saving me from too much embarrassment! Only Earl noticed (and laughed) that Billy spooked every single time it was my turn. Once we were going, though, he really was quite the professional. Leslie is a man of few words (or was it just that the torrential rainfall made it impossible to hear? ), but what he wanted was accuracy in line and striding, which required the horses to be coming from behind and adjustable. After being sure that we were all able to do this on the first day over simple lines and small fences, we were greatly challenged on the second. I was so proud of Billy as he negotiated all of the exercises like he had done them before. He even finished the day with not only doing his first corner like an old pro, he did a two stride, left corner to right corner perfectly! 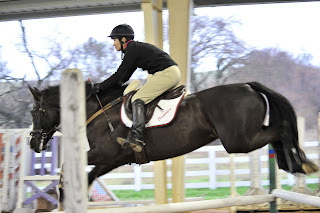 Needless to say, the clinic infused me with the energy I needed to kick me out of the Winter slump and gear up for this year's show season. Leslie's precise and friendly teaching style was perfect for Billy, and given the chance, I will surely ride with him again! A big thank you to Connie and Andrea Baxter for organizing the clinic, to Rainbow Ranch for hosting it at the last minute, to Leslie for standing in the freezing wind ALL day for two days straight to teach us, and to Sherry Stewart for photographing the clinic.